Earth, dirt, soil and all that it contains for a healthy environment to live and plant, feed and prosper. There was a time when all peoples had a healthy respect for that piece of land that they lived upon. A sacred respect, a worshipped thing of unknown quantity with a reliable certainty that the Earth would provide. Cut to the twentieth century, pre second world war … a time when self sufficiency on the land was still considered a religious endowment from God. This was especially relevant among the Germanic settlers who came from the deep soils of Silesia/Posen with the start of the settlement of South Australia. Their Lutheran teachings humbly drew their faith toward the debt to their God that the soil in this new land was holy grist for their mills and families and communities. Seasonal festivals for sowing and harvest were celebrated with gifts placed near or upon their church altars, their stern benevolence conditional on the continuity of hand to plough to faith to harvest and reward for work done. And the arbiter of all this source and supply was the Earth itself … the soils of the settled lands … in reality if not in recognition; a Pagan celebration of Gaia … Mother Earth. This was how it stood in those years before hire-purchase, compound interest mortgages and bank-loans became commonplace … When small holdings of farmland could support a single family with crops, chooks, a cow or two and the veggie patch to sustain a well-balanced diet and the household could get by on barter-exchange for what they did not produce with other farming families. I remember being told of one son, who upon joining the army in the time of the 2nd WW, literally sat down and wept when he received his first pay-packet with his own name on it … never before had he ever had money of his own. The ownership of land gave you status within the district … With the working of the soil, you were considered one of the “ins” of the farming community … as against those who laboured for their living outside of ownership of land … these were the “outs”. Seen as spurned by God and considered a lesser member of the community. “As I see it, they (the pioneers) accepted their arrival here as Divine Providence – they were led here – and their land was taken up at the hands of Divine Providence for themselves.” (Mr. “B” 80+ yrs, Barossa Survey). “Yes, there was a spiritual bond with the soil, linked with their religion. Their land was a gift from God and it was from the soil that good gifts flow. 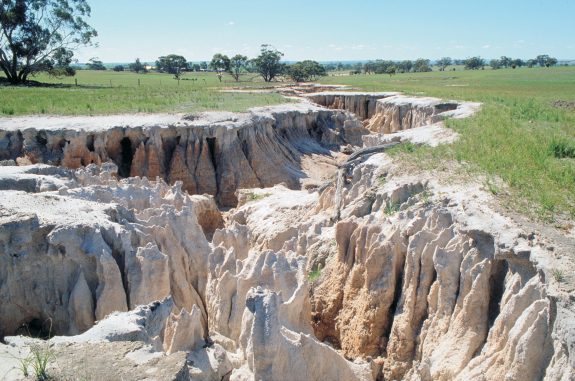 This knowledge was deeply and unquestioningly instilled in them.” (Barossa Survey). The strict discipline brought to the new land in regards to system, method and social order, sustained these hardy pioneers through the rigors of unfamiliar weather and shallow top-soils … their over-zealous regard to form and measure causing damage to those very soils they revered as God’s gift to them … their hopelessly small allotments in this dry land soon showed them reason to doubt their benevolence.
. . . overtilled the soil through ignorance of Australian conditions compared with those of Silesia where they came from.“ (Barossa Survey). The years of the Great Depression and the foreclosing by the banks on many of those small family farms drove some off the land, and by losing their land, there was “inside consideration” that they had fallen from faith with God and so were sometimes forced to leave the district and community. This had grave consequences for many Fathers and head of the family … breakdowns and suicides were not infrequent at this time, and the cruelty of financial dominance by the banks sent many other farmers into labouring for extra income in what was now a capital rather than a barter-based community. Even the wording of the teachings from the Lutheran pulpits changed with the times .. where once praise for hard work on land and stock was singular for the owners and tillers of the soil, after the War, an equal consideration was given to whatever means was employed to gain wages to support the family … God had yielded his preference toward a life on the soil to any means available to keep one’s head above water! The bankers were now writing the gospel … The conservative politicians were empowering the banks. Suddenly the means for subsistence was mercilessly altered … The soil, the Earth, lay open for rapine and pillage … cropping moved from small acreages to broad-acre and machinery from horse-drawn to satellite controlled in the space of a couple of generations. The descendants of those old Germanic pioneers, those hardened tillers of God’s earth moved from being “dirt-farmers” to “chemical-farmers” … the barter system redundant now as there was in place corporate conglomerates to shift mega tonnage and if your farm was too small for consideration, you were left behind. There was no place in this brave new world of hedge-funded mega agri-corps for either sympathy for the old handed-down generational family farm, nor banking finance for the same to restructure the size of their holdings … the family whose heart was from the soil was finished, percentage was the new arithmetic of farming. The prayer of capital religion was one of cold, hard cash … and woe betide they who lacked capital or credit, for theirs will not be the kingdom of this new God. “It is an economic position as a result of politics that young people can’t afford to stay on the land. By and large they can’t even build a ‘blinkin’ house for themselves anymore because the prices have just escalated. Mr. B. apparently, has only, as many disillusioned elderly people will do, seen government pol icy working towards this disintegration, and has failed to recognise the steady encroachment of the capitalist ideology within his own community. This encroaching capitalist ideology has been recognised by most of the younger generation, as witnessed Mr. N. (35) who knows that to be competitive in the modern economy, farms must be mechanised and holdings must be increased in size to warrant capital expenditure on the necessary machinery. He is aware that the old ideology requiring a good steward of God’s gifts to supply his family needs from his own land through his own labour is beyond the financial capability of the non-capitalised, restricted acreages which were sufficient in the days of the pioneers.” (Barossa Survey). Lament for what you have to abide. To walk hand with hand in thine. Lay dying in irreversible damage. With all this talk of immigration and its faults about congestion and using up services, I can safely say that if not for those Germanic pioneers here in Sth Aust’ back in the nineteenth century, this State would have never got to second base. The corrupt practices of land speculation by the Anglo founders nearly sent the entire settlement to the wall. In fact, it had to be bailed out with public funds from the British Government just six years after the first boat hit the sand…and would have starved to death if not for the devotion of those Germanic farmers to their soil. So I say ; forget the bankers, the entrepreneurs, the speculators..they don’t make a state rich or viable…it is those with their hands on the work that make or break a State…Reward where reward is deserved. Beautiful words & thoughts Joseph! These days a farmer’s lot is so bloody different to what our forefather’s knew it is almost beyond belief! Now it is all technology, “sustainable” farming, ecologically sound etc. What a vast difference to what the early settlers had & did. One of the few remaining constants these days are the ever changing weather cycles & their affect on farming. It is certainly not a job or lifestyle for the faint hearted of foolish that is for sure! Droughts are especially devastating to the economy & to all farmers. With the current Australia wide drought the farmers are all suffering, not helped by the token efforts of our inept, lying bloody Federal government. The efforts of many others are assisting our farmers but this is not enough! we ALL need the Federal mob to step up aid etc. When I still was working in Agronomy developing weed control methodology, a respected Agricultural economist commented at a conference about why the number of farmers was decreasing rapidly in the 1990’s. The farm gate returns of wheat had been decreasing in real terms by about -0.5%/year. So it was get big or get sold up. We operate on the wrong side of billions of dollars of agricultural subsidies. eg France gives most significant farmers about $98,000/year. Incomes are not sufficient to support sufficient management to manage the landscape as well as it should be. That is also devastating the rural population and local services such as schools etc. Sure we have made major gains, compared to my grandfathers yields between the wars and in the transition between horses to tractors, that same farm is now producing 2.5 times as much. Current tecknology has allowed his grandson to consistently approach the rainfall limited yields that wheat can give when managed well. The next big gain for wheat will to change the water use efficiency by improving the photosynthesis system. Until that happens, yields will decline as Global Warming is decreasing rainfall of WA. The minimum tillage systems which allowed this progress are based on effective herbicides with a huge reduction in soil erosion etc. However, one cannot export from the farm nutrients such as P, K, Ca, Cu, ZN etc etc with out replacing them. N can be produced by legumes, but that may not be enough. Soil pH can fall and so must be upgraded as well with lime sand. I would like to see a Royal Commission into the impact on prices of the major supermarket conglomerates, backed up by a very serious review of the impact of manipulations in the export markets. With respect to the geographical location of the article above, my fathers family came from Britain and established in the Barossa area and spread out from there. Grandpa was in the Ceduna area during the big drought of the 1890’s and traveled to WA, and took up a block there and cleared it etc. The rainfall certainty in the Great Southern of WA is much greater than much of SA. Thanking you , John for that input…the experience of one who has had direct contact with the problems and solutions of farm management always brings a better perspective to the picture. The Kartan people lived on the island for about 20,000 years before dying out a few hundred years ago. Only a small population could be maintained – about 250. The reason – according to my archaeology professor … was the lack of cobalt in the soil. Many of the soldiers settlers farms given to returned soldiers by the SA government in the 1950s and 1960s weren’t that successful. A book by Jean Nunn claims the farmers were guinea pigs, in that it was known by the government that the soil wasn’t good for farming. The reason? Lack of cobalt in the soil. Cobalt deficiency…that, I believe and if memory serves was the problem behind “coast disease” ? Coast … there’s lots of it on Kagaroo Island. Yes..I know..Here.. : https://freefall852.wordpress.com/2016/04/09/glen-and-mrs-wright/ …Oh..new post on my theory of “Logical Truth” saved..BTW. Re Cobalt. One of the reasons that the first European settlers took their stock to the beach in the early days of the Settlement of WA was to let them eat seaweed and get their trace elements. Just inland from the coast one the gutless Bassendean sands, there are very low concentrations of most essential trace elements as well as majors such as K and P. You can farm the area but it is basically solid state hydroponics. You will need the equivalent of about 25 tonnes of Chicken manure/ha. However, if you do not manage it well, you will also produce a very good crop of Stable flies which make living the area some what unpleasant. The wheat and sheep agricultural systems in WA did not get going properly until the general efficiency in Phosphorous were managed, the clovers supplied the N for the crops and then the problems with copper and zinc deficiency were recognized. It was recommended to keep a few black sheep as when copper deficient, they can get light colour bands in the wool. Now we send off soil and plant tissue for analysis and correct and balance any the problems.